I can see where the gathers are a possible change point in this version. Theoretically it makes sense to gather those sections but on the dress (and especially on you) they might look .. odd.As always another triumph of cute dress! Im starting to be terribly curious how many dresses you have … you either have a very large wardrobe or you get rid of dresses as often as you sew new ones! 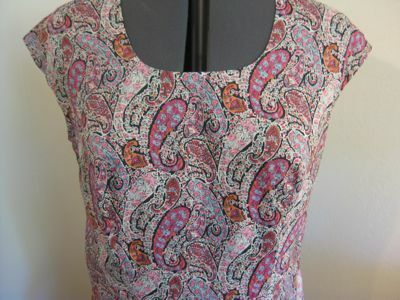 Can I just say a Liberty fabric dress competition would just be so much fun? Not necessarily administered on DaD, but somewhere in the online world. Youre a never-ending well of inspiration. I love that Heidi is the new Duro. Thoughts on Life: I too need something on the front that would bring some order to that chaotic print. I guess I dont like the print much, but I think a row of buttons or some contrasting piping would help by coordinating it a bit. 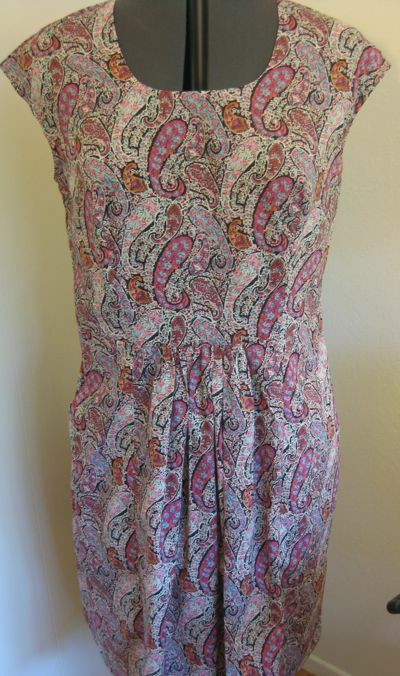 Im trying to track down the name of a particular Liberty print, do you know of any resources where I can search their fabric archives? I still have a picture of the dress I made from the fabric and I can give the date as 1989-91. Thanks! Cute! I was at Target this morning and saw the Liberty line. Nice, but too much pink for me! Still, I love that I can go to Target and see it. I have to admit…..i LOVE Heidi…I have to dig through my patterns and see what i can do a jillion times and make it look new everytime!!! 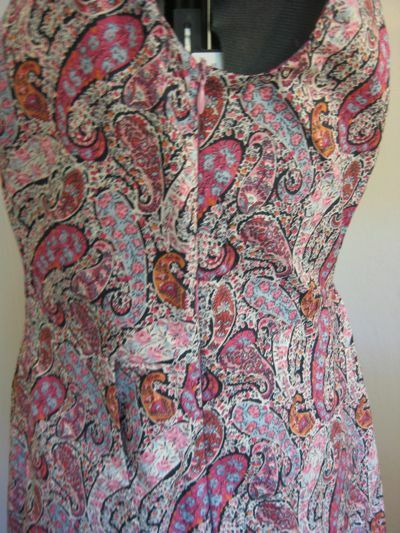 I really like this print and it looks like you got your waist seam matched nicely at the zipper. It looks great! I love this pattern and it looks super easy and quick to sew and really like a practical dress. Id wear a 48-50-52 in the burda style pattern and it only goes up to a 46. Ive never really tried to grade up a pattern. Does anyone know how difficult this would be to alter? Could I just add an inch or 2 at the side seams? Any suggestions for a similar pattern in a plus size? Actually I think that is Bourton fabric. If you go onto Libertys website they have it there. It has all the same paisleyish squiggles and the little flowers within, but in different colourways to your Heidis. Erin said its hard to mark with a pencil — the pencil drags the fabric along. I ended up using chalk, which tends to brush off.On some tricky or fluffy fabrics, using a slice of soap to mark the lines works wonders! Dark soap for light fabrics and vice-versa. Disappears after washing as well. What a great change to the Heidi. I read your earlier post and couldnt picture in my head what you wanted to do with it. But I see it now and I think it works very well. 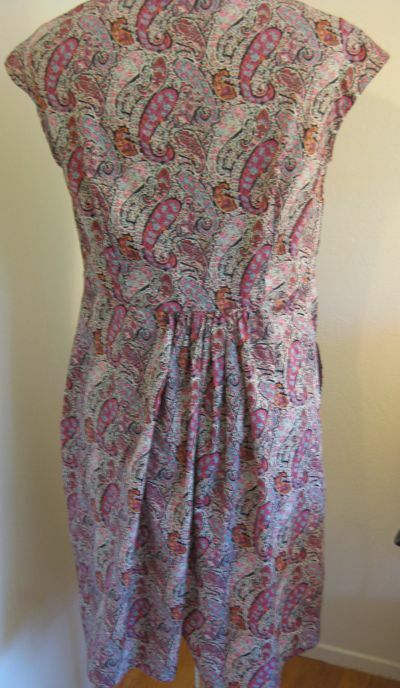 The print is perfect for a simple dress like this! Oh, is there any pattern as joyous as paisley?! Im thinking a deep inverted pleat would look better than the gathers? Less ploofy and bunched up? Oh, I get so excited every time you post a new Heidi–I just ordered two fabrics for my own Heidis and am planning on starting them as soon as I finish a current project. Actually, Ill be making three: one in the same mulberry orchid Joel Dewberry fabric you made your second one in (because I became obsessed with the fabric once I saw it! )one in Amy Butler Lotus collection Morning Glory (linen color)and one in a vintage Lilly Pulitzer print that my grandmother purchased in Hawaii decades ago–its a dark navy background with brown and black batik-like fireflies all over it. Im starting to like the Heidi more and more – it looks so easy to wear and comfortable and pretty straightforward to sew up.Im with some other posters that Id want to add some detail that grounds the pattern – Im leaning towards edge piping, myself, along the neck and sleeve. I think this fabric is Bourton but in a different colourway than is currently available. I like the paisley-made-of-roses component of this pattern. Oh, I rather like that, fabric and all! Though, granted, Liberty paisleys are possibly targeted more at the taupe-tights-wearing, Miss-Marple/Midsomer-Murders-watching end of the market.Yes, its Bourton alright. Anyone who does like the pattern can purchase it here: http://www.shaukat.co.uk/moreinfo.asp?product_id=180. [No, Im not on commission. I think you recommended Shaukat about a million years ago, Erin, when you posted about visiting Libertys then slightly disappointing fabric department.] Dont know if its named after Bourton-on-the-Water (also known as the Venice of the Cotswolds a large village in Gloucestershire, not far from Stow-on-the Wold). But if it isnt, it should be. Maybe someone higher up the Liberty food chain will tell us.